enroll your friends and neighbors. that you can print up on your computer. 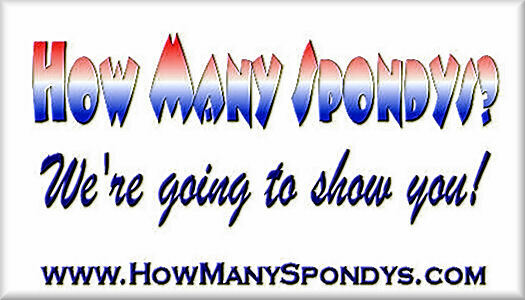 Here is a "How Many Spondys" poster you can print up and give to the bars and restaurants that you enroll in saving bottle caps. Ask them to display it in their window to show they support our cause! 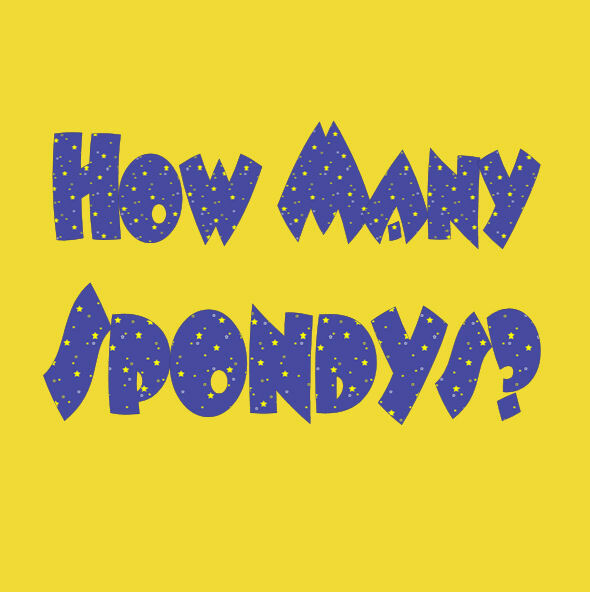 My name is ___________________, I live and work near you and have a chronic degenerative inflammatory disease called Ankylosing Spondylitis (AS). AS is a disease that, according to figures from the Centers for Disease Control, affects 2.7 million Americans. That's more Americans than have Multiple Sclerosis, Cystic Fibrosis and Lou Gehrig's disease, COMBINED. My guess is that probably comes as a surprise to you. Sometimes, it seems as if the only people who know about AS are the ones who have it. But I'm trying to change that, and I'd like to ask for your help. Don't worry, I'm not asking for money. I'm asking for bottle caps, not to be turned in for cash or anything like that, but to be used in a conceptual art project, which will be completed next Spring. Let me explain. When the latest Centers for Disease Control figures came out, it showed that AS is more prevalent than even Rheumatoid Arthritis. So, a bunch of us decided that we needed to give the public a visual demonstration of just how many 2.7 million really is. Why? 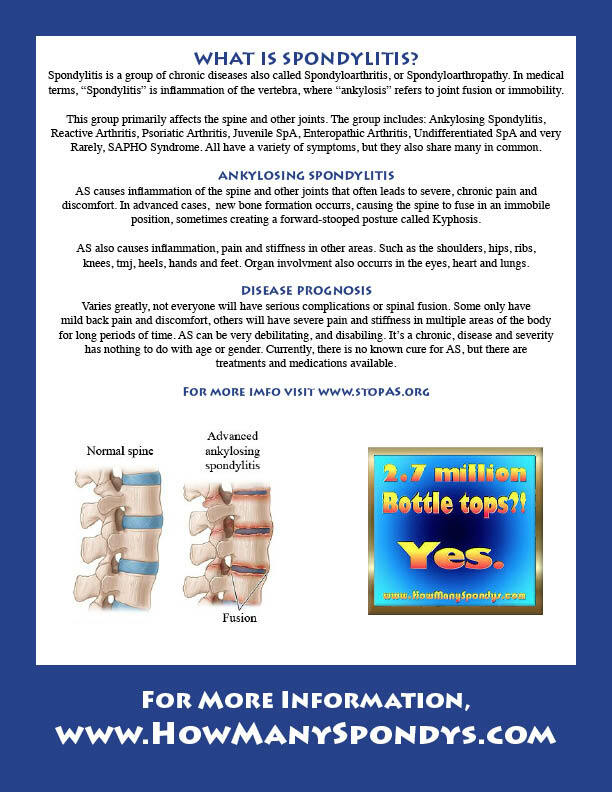 Because even many doctors still believe that AS is a rare disease. I mean, how do you change such an established mind-set? Well, we thought that if we could show everyone what 2.7 million looks like, they might better understand just how many of us there are. 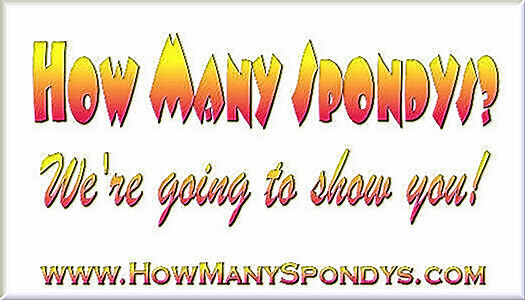 So, those of us in the online Ankylosing Spondylitis community, started something called www.HowManySpondys.com, a project, whose goal is to collect 2.7 million bottle tops / bottle caps and on World AS Day 2015, display them for all the world to see in a way that will have the most visual impact. But first, of course, we have to collect 2.7 million bottle caps / bottle tops. And that's where you can help. Would you be willing to save and donate all of your used bottle caps / bottle tops to our project? In return, we would list you on the participating sponsors page of our website, and provide you with a poster to place in your window showing you are a proud sponsor of our project. In addition, as a supporter of the project, you will be given a special invitation to attend the event in May of 2015. Thank you, I will contact you in a couple of days to assess your interest and set up specifics for collecting the bottle-tops. 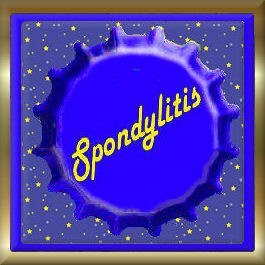 An excellent chart designed by Lisa Raper that you can print out and give to people, which explains the basics about Spondylitis. 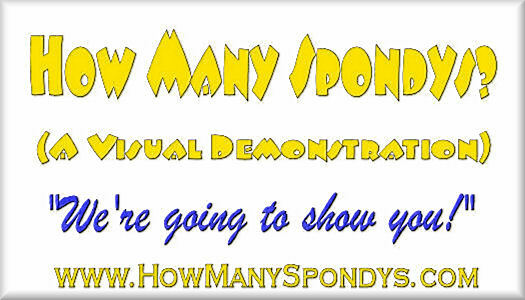 Watch this space for further updates regarding the "How Many Spondys" Project.